Another healthy and tasty dish for those bean lover. I cooked this stew in Italian style of cooking. 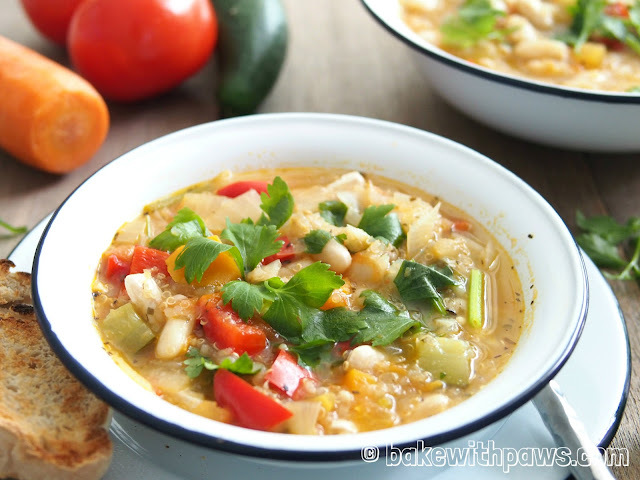 It is quite similar to the Lentil Vegetable Stew recipe I share earlier. But, with difference herbs used. ¼ cup quinoa, washed and drained. 1. Soak white bean one night before. Drain and steam for 40 – 50 minutes. 2. In a pot, heat olive oil over medium heat and saute both garlic and onion until softened. 3. Add in carrot and tomatoes, stir for 1 minutes. Then add in all the dried herbs and stir for about 1 minute. Add water enough to cover. 4. Add capsicum and quinoa. 5. Turn to high heat and place a lid on the pot and let it boil. Turn down the heat to low and simmer for around 20 to 30 minutes until the quino is cooked. 6. After 30 minutes, add the steamed white bean and salt to taste. 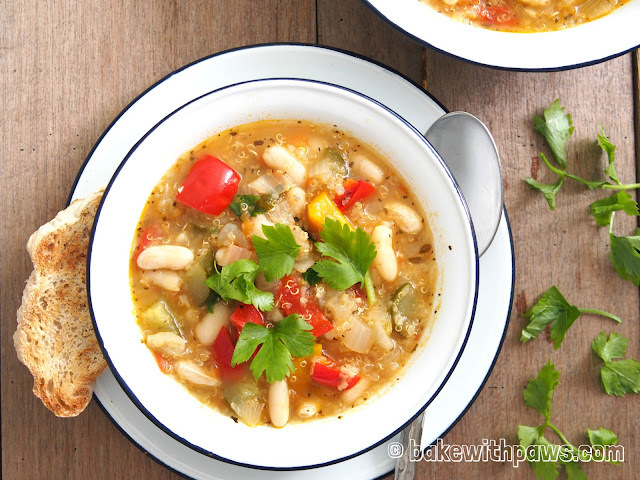 White bean can be substitute with Chickpea. If raw white bean is not available, you can use the caned white bean.